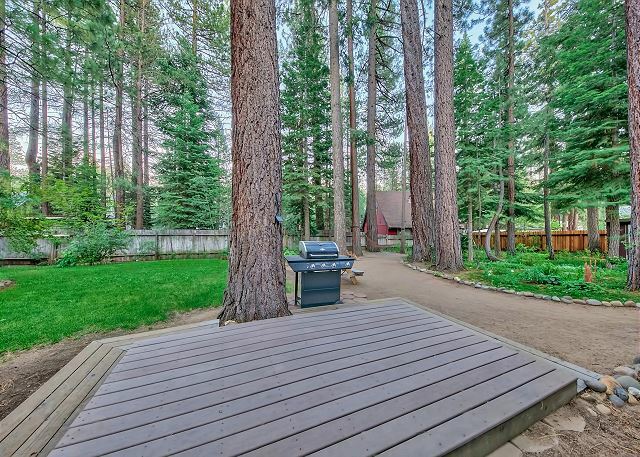 Family friendly cabin nestled on a beautifully landscaped double lot. 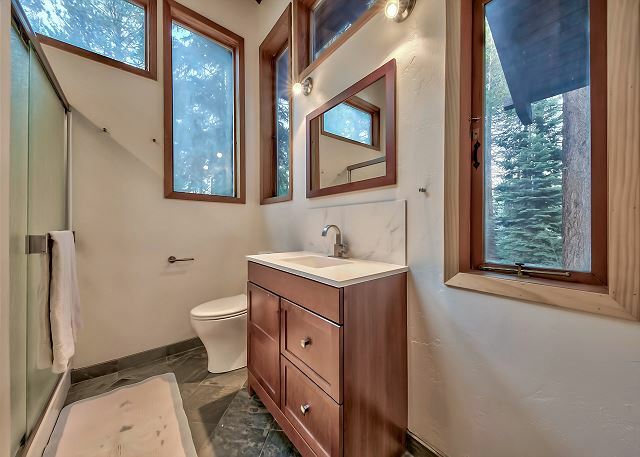 This 3 bedroom (Plus loft) cabin has a unique layout featuring downstairs living and kid friendly upstairs loft. 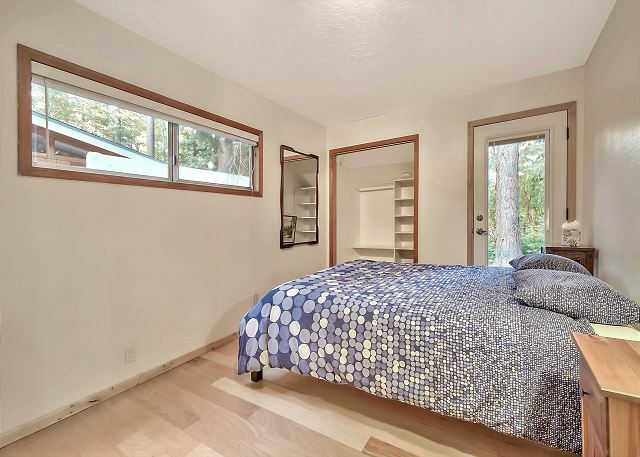 This cabin is located close to the bike trails that lead to Pope Beach, Camp Richardson, Baldwin Beach and the visitor center and stream profile center. 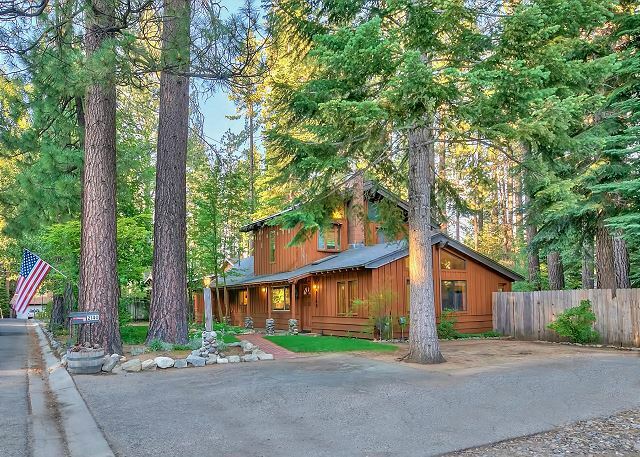 If you and your family are looking for a quiet, peaceful retreat this could be the home for you. There are numerous restaurants close by (The Cantina, Burger Lounge, Sonny's BBQ, Cakes By the Lake, Jalapeno's, Evans) and it is on a primary plow road for easy access in the winter. 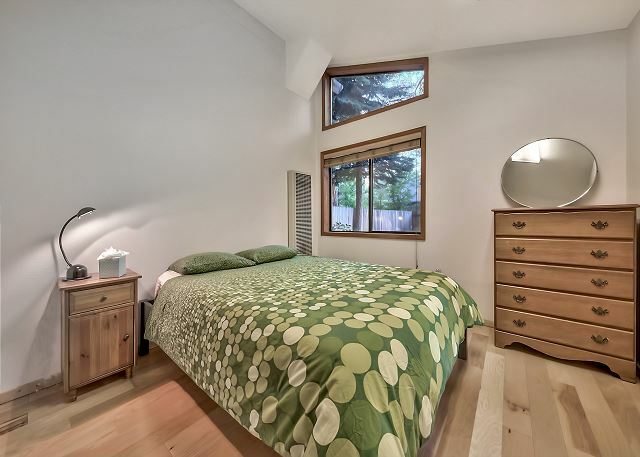 As you enter the home there is a bedroom to the right with high vaulted ceilings. The spacious dining area and open kitchen are next. 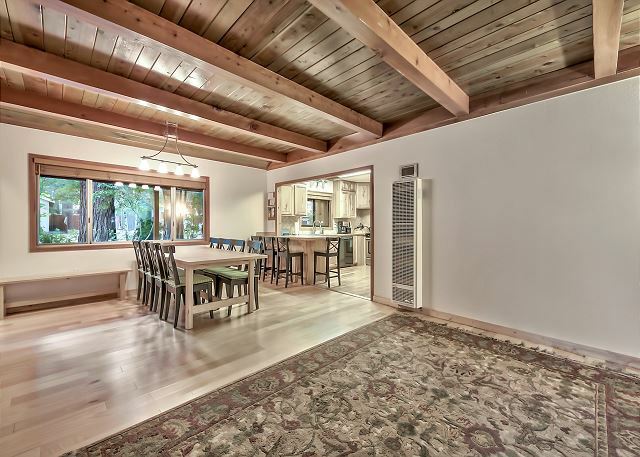 The dining area has a large family table that seats 8 people and is adjacent to the gas fireplace. 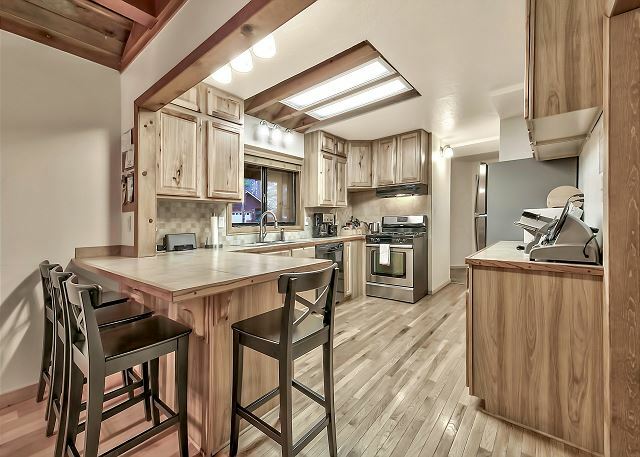 The kitchen has tile counters, gas stove and all the gadgets the cooks need for a family feast. The cozy living room features a flat screen TV and plenty of comfortable seating. The slider to the amazing backyard is off the dining area. 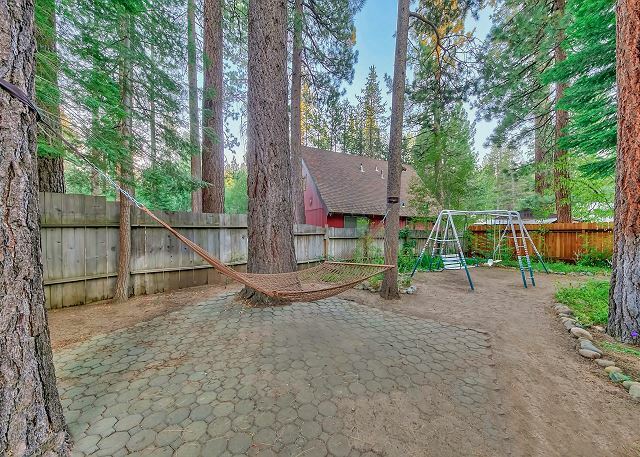 The backyard has a large deck, gas bbq, kids swing set and plenty of room to relax and enjoy the fresh mountain air. Down the hall from the kitchen there are 2 bedrooms and a full bath and a laundry room. Upstairs is the kid zone, 4 sets of twin bunks, full bath (shower) and a television. Upstairs Loft accessed by a real staircase: This loft space has vaulted ceilings and room for the kids to play, 4 sets of twin bunks (metal frame). Washer, Dryer and on demand hot water. Maximum Vehicles: 3 . vehicles must be parked in driveway, no street parking allowed. a guest from Rancho Cordova, CA does not recommend this vacation rental. Our main purpose for this trip was to spend a weekend in the snow. The photos of the house fooled us. The place definitely doesn’t look like the pictures. Not as big and beautiful as it seem to be in picture. We arrived to all the trash bin empty and not lined and no trash bag available to line it with. Luckily we read other reviews and brought a lot of our own. Very limited on kitchen supplies. The supplies looks like various items picked up from thrift store. No oven pan so we had to make a run to the local store for a disposable foil tray. Only 1 medium pot. 2 small/medium pan which are all not non stick so everything we cooked sticked to it. No coffee supplies like many other places we’ve stayed at before. Very limited seasonings for cooking and the ones that are there looks old, we didn’t feel comfortable using it. Keep a close eye on you little ones. The bottom gaps on the stair rail on second stair is big enough for my one year old to fall through. Worse part of all, we’re expected to leave the kitchen the way we found it, ie: all the dishes washed and placed back in cupboards. Pots and pans clean and Dry and place back where it was. Not sure why we paid $250 cleaning fee if we are doing the cleaning. Other places we stayed simply ask that we place everything in dishwasher and start the dishes only. The TV was locked to what the owner want only so we can’t even a watch YouTube. Very limited cable channels so having YouTube on the TV would’ve been great. We’ve stayed at many cabins over the years and probably won’t be staying here again. One good thing is the backyard is big enough for us to be able to enjoy the snow without having to make a drive out. We do not ask you to replace your dishes, we only ask that you start the dishwasher. I will double check the notes in the home to make sure they match our policy, those instructions were in your emails with the lock box code. We will check the kitchen pots and pans to make sure the supply is enough for a group to cook their meals. We appreciate the feedback. Home was cozy after we turned up the heaters. Basically stayed home didn't end up going out since it was very cold out. Home was lovely. Only wrong thing was room had a problem with the heater, was freezing and not enough paper towels/toilet paper for 3 nights with 9 people. Heater has been repaired and homeowner purchased extra space heaters to keep the house warm and toasty. This property was perfect for us. We had ten dudes and there was plenty of space with a huge backyard. Fully stocked with all the basics we would need. It's not an ideal location if you want to go into Stateline but we didn't need to go anywhere!Highly recommend! 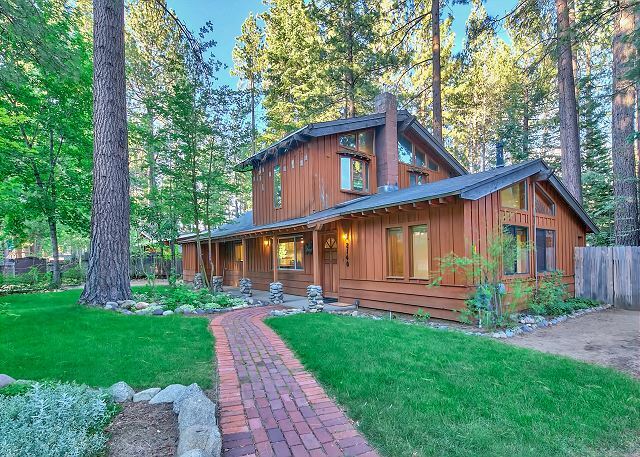 Beautiful South Lake Tahoe home in a great location. We had a three generation family vacation and the location, property and house was just what we needed for two weeks. We enjoyed the beautiful back yard every evening. We could walk or ride our bikes to the beach. There are plenty of good restaurants within walking distance too. We were disappointed that the bathrooms needed cleaning when we arrived and we had to fill the propane tank to use the gas grill. I was not reimbursed for the gas as promised. Two rolls of toilet paper with seven people didn’t last long. We needed to purchase laundry soap, dishwasher soap, tp, paper towels on day two. The management company was nice to work with while planning our stay last winter. I had a lot of questions that were answered promptly. I took in the recept for the propane a week before we left. I called a week after returning home to ask when I could expect my deposit back. After my call the deposit was sent. We loved our vacation and the house we rented. I think for the fees we paid, that we should have been supplied with the basics for a two week stay. I will follow up on the propane refund, we do have your receipt and I thought it was mailed--will double check for you. We really liked our stay in this house. We especially loved the backyard. Downstairs bedrooms are a little spare. Only one had a mirror. Kitchen was great and had everything we needed. Would definitely stay here again. The house was nice but no screens on the windows upstairs so we couldn't open the windows to get air in. The yard was nice and big so my kids enjoyed playing out there when we were at the house. I would stay here again for sure. Family friendly house. The backyard was delightful. The pictures make it look a little nicer than it is. But was perfect for my family. Lots of toys and games. The loft with bunk beds was fun. Well stocked kitchen. Loved this property and would stay again. Very well equiped home. Excelent for children as the upstairs has 4 bunkbeds and a full bath. Two downfalls are the bedroom to the right of the entry was extremley hot!!!! because of the fire place so no remedy. Also No closet. All of the beds had horrible, hard mattresses! Great place for families. A lot of space and layout was conducive for get together. Had all amenities you could want and kitchen was stocked. Plenty of parking and a lot of space in backyard where the kids played in the snow (what little snow at the time we went). The place had plenty of heaters that you could control with a thermostat but only a tiny space heater upstairs in the loft where there are 8 bunk beds. It was okay because we just let the space heater run and the heat from upstairs rose to heat upstairs just enough. Only negatives were the posted pics were deceiving by way of being edited to make the place look very modern, but that is not a big deal and the audio/tv receiver did not work. Wish they had extra bath towels for use. Also the place had a few lights bulbs out, but the management company was responsive and came by to replace within the hours. Also they dropped off a pack and play and 2 high chairs for use. Overall great place and would stay there again. everything was beyond expectation. A clean cozy and confortable house. Our holidays were wonderful, although we were a litle bit disappointed as we expected some snowing from outside. besides that the place it is beautiful any way. Perfect home for those who have children. we do have a pleasant time at this property and we highly recommend it.